We are currently facing unprecedented global relief and development challenges. Conflicts are driving historic numbers of refugees and internally displaced persons to the brink, climate change is accelerating the need for improved infrastructure and innovative resource management, and there is an absolute requirement for creative thinking around community resilience and finding local solutions to emerging global problems. Fortunately, we also live in an age of tremendous advancement in science and technology, and there is a growing need to translate those gains into appropriate relief and development solutions. Blumont builds on two decades of proven experience to forge an enhanced development capability that is more locally focused, highly trained and empowered with advanced technology, tools and information resources to implement the most effective programs. We bridge the ideas of donors to the desires of communities and design optimal, sustainable solutions. We are unwavering in our commitment to business integrity, technical excellence, and maintain the trust of donors who support us and the program participants we empower. Blumont is advancing development when and where it matters most. Our work builds on success over the last 20 years in more than 40 countries, and includes extensive experience in conflict zones, disaster areas and other challenging environments. We leverage this expertise with integrated applied learning practices to produce high-impact results. We design, implement and monitor our programs in close and constant collaboration with our donors and beneficiary communities. This is supported with a continuous training regimen and leading-edge, cloud-based platforms for talent management and enterprise resource planning. Using these systems, we collaborate closely with vulnerable communities, empowering them from relief and recovery to sustainable resilience. Blumont delivers innovative, evidence based, locally driven solutions that advance the aspirations of people, communities and donor partners worldwide. Collaborate: We listen first and engage with local communities to understand their needs and tailor specific programmatic support. Innovate: We apply technical capabilities flexibly and creatively to meet unique challenges. Transform: We rigorously measure and analyze the results of our work, apply lessons learned and continuously improve our approaches to sustainably transform lives and communities. Our core values embody our commitment to transparency, accountability and honesty as a relief and development partner and a steward of public resources – they are non-negotiable and are reflected in everything we do. Program Management. We have evolved a repeatable cycle to design, manage and learn from our program work. We ensure the continual improvement and integrity of these processes through capable corporate governance, reliable risk management and the leveraging of appropriate technology. Within our set of capabilities, we can create, initiate, operate and terminate programs more competently than our competitors. We achieve this differentiation through innovation, efficient cost controls and accountable management of programs. Our integrated teams at headquarters and in the field work together to achieve their program objectives on time, on scope and on budget. Blumont capabilities align with current global development needs. Our programs have improved and expanded critical capacities in dozens of countries, and include irrigation in Afghanistan, schools in Pakistan, roads in Gaza, essential services in Syria, radio stations in Nigeria and climate response in Mali. Our work extends deeply into beneficiary communities and includes health and education services for Syrian refugees, capacity building for civil society in West Africa, and psychosocial services for victims of conflict in Colombia. 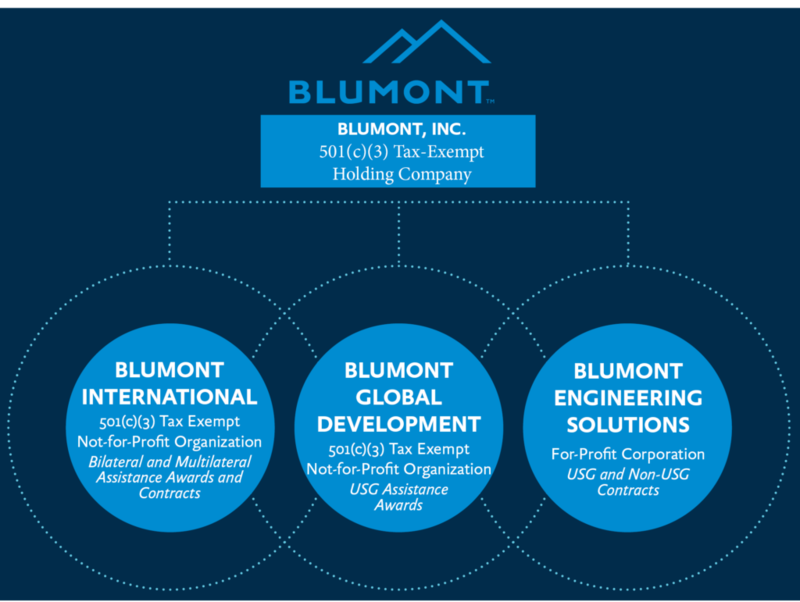 The unique structure of Blumont sets us apart from other relief and development organizations. 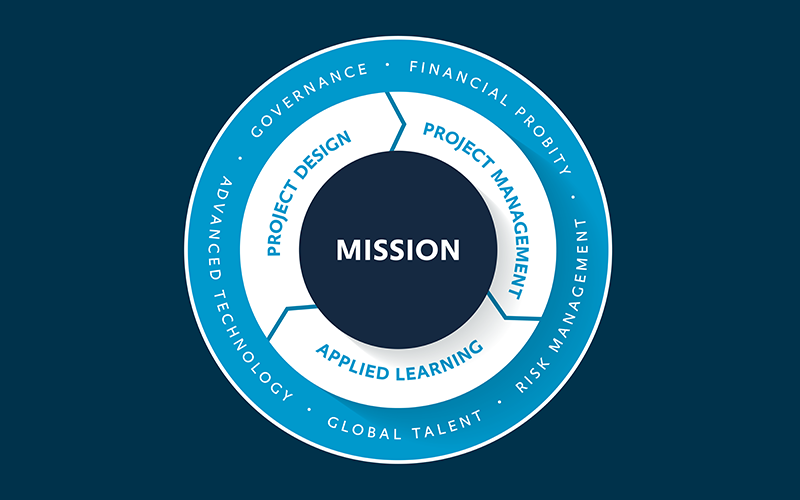 We are structured to drive efficiency and quality, manage costs, improve operations, increase compliance and create the best local solutions to advance global relief and development in response to donor-partner requirements and program participant needs. Blumont International works with non-US based clients to provide sustainable solutions to problems being faced by vulnerable and displaced populations around the world. Blumont Global Development works with US-based clients to implement programs ranging from relief and early recovery to development that are tailored to operational contexts and informed by local perspectives. Blumont Engineering Solutions works with US and non-US based clients to build long-term resiliency through community-based infrastructure improvements and disaster risk reduction.